At this point, you’ll probably want to step out of the mundane. You may have your own blog, but it doesn’t quite have it’s own personality with the standard theme. In fact, most visitors will quickly pass on to another blog unless you change your theme. Themes give bloggers the biggest chance to customize the look and feel of their blog. Within seconds, you can literally change the layout, pictures and full design of your website with just a click of your mouse. Themes are also relatively easy to upload and install. Use the guide below to learn how to upload a theme using cpanel. Note: For the sake of this guide, I’m going to use the theme Almost Spring. If you’ve never installed a theme before, I highly suggest you follow this guide step-by-step to get the feel of installing your own theme. Find a theme you like at the WordPress Theme Viewer. Choose wisely. 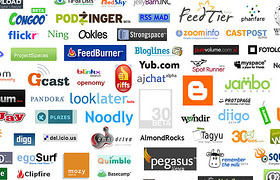 Most blogs are subconsciously judged by viewers within the first second of loading a web page. If you choose a poorly designed theme, it’s very unlikely that you will retain any new viewers. Download and save the theme’s .zip file to your desktop. There is no need to extract the contents. This make look a little overwhelming, but it is easy to navigate. Click on the image of the folder next to the folder name to navigate around. Here, you’ll want to click on the folder next to ‘www’ then ‘wp-content’ then ‘themes’ and you will now be in your blog’s theme directory. At the top of the page will be an arrow and the words Upload Files, click on the text to be taken to the upload page. From here, select browse and then locate the .zip file on your desktop that you saved earlier. Press the upload button and then the file will be uploaded and you will be taken back to the theme directory. 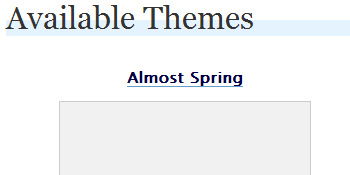 From here, click on almost-spring-10.zip and a list of options will appear on the right hand side. Select ‘Extract file contents’ and cpanel will automatically install the theme for you. To activate the theme, login to your blogs administration panel at http://www.YOURDOMAIN.com/wp-admin/ and click on the presentation tab. Here will be a set of themes for your blog. Click on Almost Spring to apply it. Visit your blogs homepage to view all of the changes. You finally have a working blog that has a design to best suit your needs. Now you need to start adding some content. Click here to learn how to start building your content.